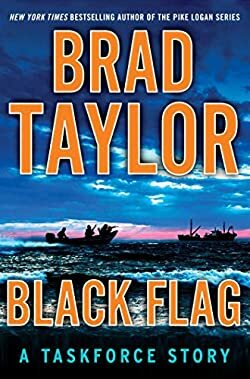 On leave after a particularly critical and dangerous mission with the Taskforce—a top secret counterterrorist unit that operates outside the bounds of US law—operators Knuckles and Brett have joined Pike Logan and Jennifer Cahill in Charleston, South Carolina. Their goal is to learn more about Grolier Recovery Services, the archaeological research agency that the Taskforce team uses as sophisticated cover for their work. But when Knuckles accepts a job to find missing treasure from the notorious pirate Edward Teach, better known as Blackbeard, the whole team is put to the test, because their new employers have a very different agenda, one that leaves members of the Taskforce at the mercy of real pirates determined to get their hands on a shipment of precious contraband at any cost.